If you've got a certain kind of Facebook friend — an End-the-Fed, mechanical-elves, Monsanto-causes-cancer, Nibiru-fearing cousin, say — you may have already heard the "news" that Newtown shooter Adam Lanza's father was a key witness in a congressional hearing about a banking scandal. Or the theory that the new Batman movie predicted the shooting. Or that The Hunger Games did. None of these conspiracy theories are true, obviously. But they're all over the internet. 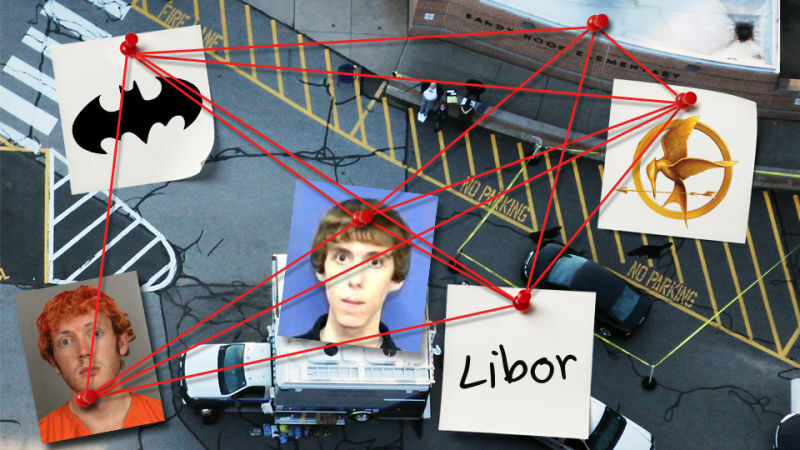 Adam Lanza & Batman theater shooterhave common denominators.Both their fathers to testify in US Senate hearings about the Libor scandal. But: Since 2005, we've had a mass shooting every four months on average. It's true, though, this is the only one with little kids right before Christmas. Must be Obama. "This is the official map from the movie The Dark Knight Rises... 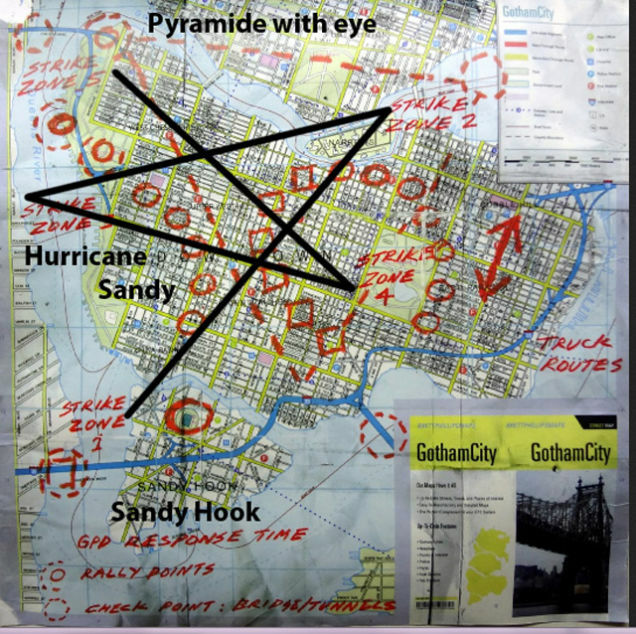 Here's what I saw so far... Pyramid with an eye... Hurricane SANDYs path... Sandy Hook... Strike points line up to make a pentagram"
But: Despite what the Facebook page "Satan" claims, Commissioner Gordon doesn't say "nothing is a coincidence" during the brief shot of a map in which the words "Sandy Hook" are visible. Also, uh, no. But then there is THIS. SGT Report cites a "coincidence" that will leave you thinking about a planned scenario at Newtown, just the kind of operation secret societies are reputedly famous for. In The Hunger Games, many times called a model of predictive programming, the ritual sacrifice of 23 children is carried out. Twelve districts, two children from each district; they fight in pairs and kill each other until one winner is left. 23 children are killed. In Newton, Adam Lanza killed 20 children. The author of The Hunger Games, Suzanne Collins, is listed by Wikipedia as one of the famous people who lives in Newtown. You take it from there. Call it whatever you want to. I try to avoid winging big stretches, but this is too stunning to omit. WTF.